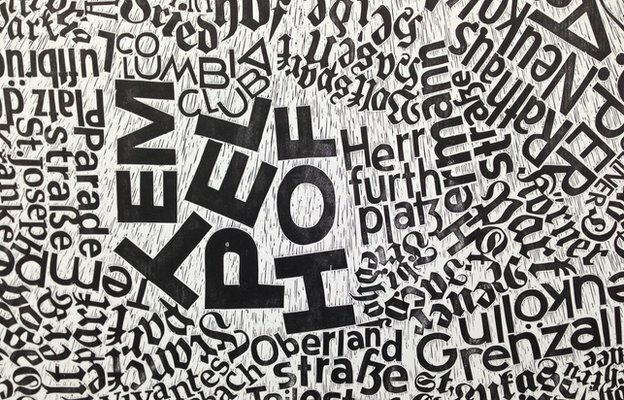 Artist Mark Andrew Webber has spent months on the streets of Berlin creating city maps made of names of streets and areas. What is particularly unique about Webber's work is he used the typeface he has spotted in the areas he has explored. 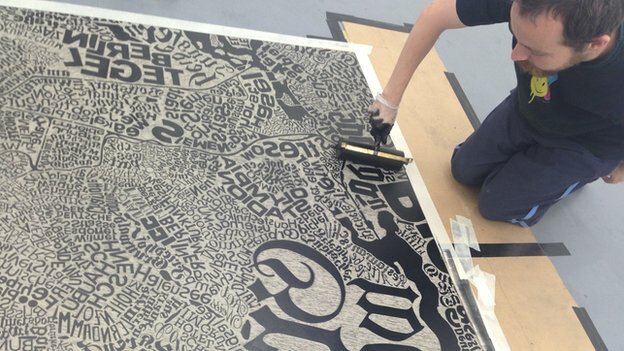 His latest and largest work is a massive 22 sq m map on lino. He spent 6 months and hour upon hour carefully carving the wording. The mass of typefaces are copied from actual signs he spotted - restaurant names, street signs, posters, anything that had print on it. Webber said of this latest work:"The typography is uniquely German, uniquely Berliner." 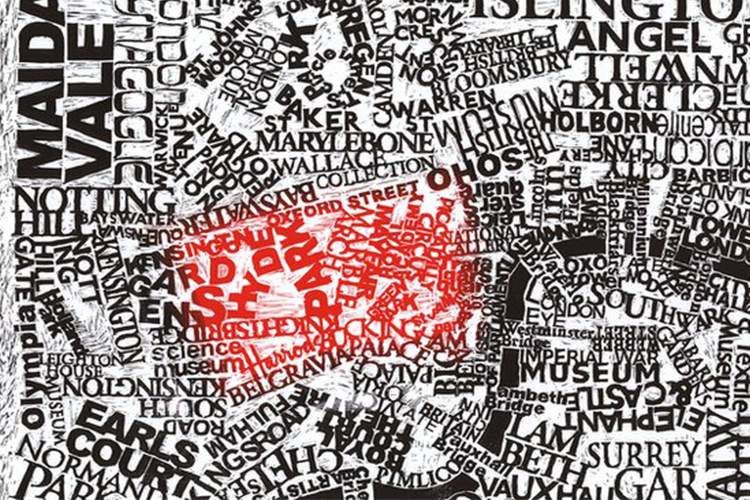 The huge map can now be seen in Shoreditch where the artists is having his first solo. His works will be on the floor allowing people to see up close the extreme detail. There are also some of Webber's previous works including written maos of Paris, Amsterdam, New York and London. "It's not just an exhibition, it's an experiment in progress," says the artist. "I want people to come in and help me make prints of this map. It's huge, I could do with the help!" "People ask me how I have the patience to do this but I just I get lost in the detail, the time just flies by. "I like being able to work in detail. It's obsessive I know, but I love it." What is even more incredible about Webber's labour is that at the age of 12 he was diagnosed with juvenile chronic arthritis at the age of 12. "The arthritis affects all my joints. My hands hurt all the time but a combination of medication and loving working helps me just get on with it and ignore it," he says. "I decided a long time ago I would not let arthritis prevent me from doing what I love." "I can get lost wandering the streets to research my maps or be feeling lost inside. Rather than fear it gives me a sense of awe, it calms me down." Webber wants the public to help make prints of the huge map at the exhibition in Shoreditch helping him to ink the map and press the paper to make prints. "I want people to become actively involved in this. I want them to love it as much as I do," says Webber.